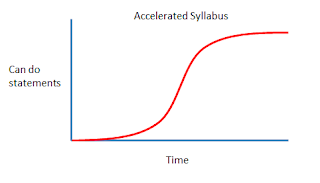 In this post I want to examine how group dynamics affect performance objectives and the implications on syllabus development. For the past few weeks, I have been searching my university database for applicable research on the subject in TESOL and general adult education. While the results are clear that collaborative learning benefits training, I have been unable to find references to show how group development impacts results (except in e-learning). If you are aware of research please let me know. I’m sure some of the books I see on the MA TESOL reading list must include this subject. The stages of group development have remained relatively intact since Tuckman’s forming, storming, norming, performing, adjourning framework in 1965. To this, we’ll add Lencioni’s Five Dysfunctions of a Team, a bestseller now prevalent in management training. While nearly 50 years apart, these two structures are aligned. In fact, Lencioni’s dysfunctions seem to reinforce Tuckman’s legendary model. The dysfunctions result when the stages are not properly resolved. Taking it a step further, we can apply the dysfunctions of a team to common class problems, both student-to-student and student-to-trainer. Group and pair work is constrained. Learner opinions are formed only by role-play cues. Poor learner interaction without trainer involvement. Learners doubt course material and trainer. Learners withhold opinions until trainer establishes popular views. Discussions are lifeless and students remain passive. Trainer is unable to obtain feedback on training and learning styles. Trainer is unable to assess whether materials fit learners’ needs. Low homework / self-study completion. Learners do not consider or provide material to improve course. Learners do not listen to their classmates. Learners do not use trainer as a resource outside of lesson. Unclear progress, no pressure to improve. Learners merely repeatedly practice the language they already know. Trainer does not introduce or enforce risk taking or improved performance. Learners do not notice what they have learned / do not apply lessons to real life. Training objectives are not defined / reached. I have provided a long list, but it is certainly not complete. But we can see that certain course shortcomings can be attributed to group dysfunction, either between the students themselves or within the trainer-student relationship. If this is the case, it makes sense to ensure we as trainers encourage and allow the stages of group development to occur. This should be incorporated into syllabus design. 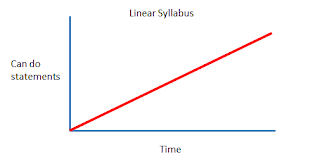 However, most syllabi I encounter (and have made in the past) are linear (meaning we achieve the training objectives at a steady pace), essentially asking the trainer to jump straight to the performing stage. Naturally, the trainer will front load some team-building activities (forming) and needs analysis, but targeted lessons soon follow. I advocate an ‘accelerating’ syllabus, in which the course slowly builds toward the can-do statements. Toward the beginning of the course, the aims of the lessons are aimed at completing the group development stages. As the course progresses, the learners are able to accomplish more during the performing stage, reaching the same training objectives in the same timeframe. · Establish preferred activity types based on learning styles, interests, etc. For many trainers this will come naturally, yet all too often I see elements in the wrong stage of group development. Furthermore, a standard linear syllabus superimposes itself on the stages of group development and pushes the performing stage further to the right. The list goes on and on. The point is, if we slow down at the beginning, we can go faster later. From a business point of view, a course in the performing stage is more likely to extend the contact or pressure management to continue the program. Naturally, different groups progress through these stages at different speeds and the group will shift between stages periodically. For example, when teaching a whole department, the trust level among the students may already be established, only forming the group with the trainer requires effort. But it is important for the trainer to recognize the stages of development and the dysfunctions of a team. By doing so we can improve our training and ensure the learners are truly reaching the objectives. A really good and very interesting read. Like you mention I think most (probably effective trainers) kind of subconsciously already follow these stages, but even so it is very helpful to be reminded and bring these highly important factors to our awareness. It made me think about some of my classes. Being more specific the more effective / productive classes. The classes where we all have a great understanding and rapport. These effective classes are the ones where we have spent more time getting know each other, being curious about one another (the forming stage). Like to suggest these early stages aren’t to be neglected.